In 1930, Regina Jonas turned in a Halachic treatise at the College for Judaic Studies (Hochschule für die Wissenschaft des Judentums). It was titled, “Can a woman be a rabbi?” Jonas was conservative and lived strictly according to the Halacha. For her, achieving equality for Jewish women by liberalizing religious laws as reform Jews had done was out of the question. Instead, she wanted to prove the Halacha said women could be rabbis. In an 88-page polemic, she intensively analyzed clauses in the Tora, Talmud, Mishna Tora (Maimonides), Shulchan Aruch (Josef Karo), and other rabbinical writings. She also included outstanding women in Jewish history in her argument. Although the women were not rabbis, they exercised rabbinical functions in that they made Halachic decisions that were later recognized by rabbis. In addition to famous biblical protagonists, Jonas also analyzed the stories of Talmudic personalities like Beruria, Yalta, the Hasmonean queen Salome Alexandra, and later, the woman around Rashi, his daughters and granddaughters, who were involved in interpreting the Halacha and whose influence was apparent in the writings of their men. Jonas showed the question of whether women were allowed to wear a Tallith had already been addressed in the Middle Ages, when Brune of Mainz caused general outrage by wearing a Tallith Katan. A rabbi who was asked for advice responded the Brune was allowed to wear it. Jonas also juxtaposed the Talmud’s pro-female and anti-female clauses. In addition, she also cited “anti-male” stories which described the “weaknesses” of high ranking rabbis. Jonas also drew distinctions between Halachic rules and the opinions of individual rabbis. For her, the decisive factor was not that a prohibition existed, but the reason for its existence. One example is Jonas’ handling of the question: “May women teach?” Traditionally, the rabbi is primarily a teacher (rabbi = my teacher). The Talmud clearly forbids women to teach children. But the Talmudic justification for this is not that women are too stupid or for some other reason incapable of teaching. Instead, the rabbis in those days feared the appearance of a woman in the public profession of teacher could endanger observance of the commandment of “Tsniut”, which required reticence and chastity. If a father was picking up his child at school and a woman teacher happened to be alone with him in the room, it was possible that a compromising situation could arise. Regina Jonas used another example from a related area to advance her argument. She said the rabbis no longer upheld a ban on women being involved in trade because the justification for it had become obsolete. According to the Talmud, woman were not allowed to be vendors on marketplaces. The “payment of money into another’s hand” could lead to compromising contact and undermine the “Tsniut” commandment. But one rabbi wrote an opinion that stated the times of economic prosperity in which Jewish women did not need to work were over. He said at the time that there were so many women working in the markets that seeing a woman would not be anything special, so woman could be allowed to work as vendors. Jonas extended this justification to the question of allowing women to teach. The ideal of “Tsniut” played a key role in Regina Jonas’ thought. Jonas expected women themselves would renew Jewish values like modesty, reticence, and chastity in the face of modern immorality. In her opinion, a woman rabbi had to remain unmarried. Nevertheless, she believed a woman could freely decide whether she wanted to spend her life as a wife and mother or pursuing a career that corresponded to her talents. She wrote that women were well-suited to the rabbinical office because feminine characteristics like pity, social empathy, psychological intuition and better access to youth were significant requirements for the job. She went as far as to write that women rabbis were therefore a “cultural necessity”. Jonas’ treatise was given the grade “good”. 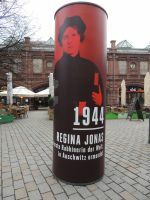 The college nevertheless would not ordain her as a rabbi, conferring on her only a diploma as an “academically qualified teacher of religion.” It was not until five years later, in 1935, that the liberal Rabbi Max Dienemann issued a rabbinical diploma to Jonas in Offenbach. After that, she had only a few years to work as a rabbi in Berlin. She was deported to Theresienstadt in 1942 and murdered in Auschwitz in 1944.